Silver and GOLD PRICES turned up today. This week you’d have thought SILVER and gold prices were going to drop off the edge of the earth and the dollar was going to soar. Bottom rail’s on the top now. Silver actually rose this week and the gold price is a measly 80 cents lower. 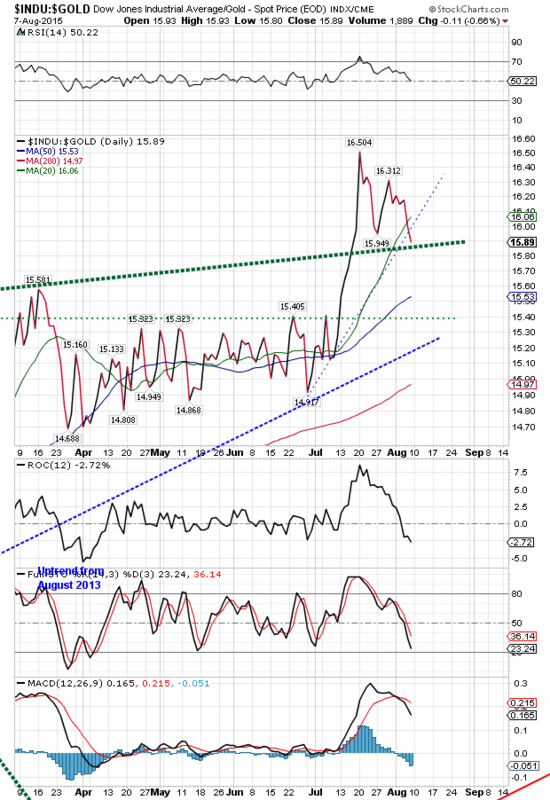 Dow in Gold and Silver are sharply lower, and stocks are looking a mite peaked. Dow broke crucial support today. Dollar Index probably topped this week, and platinum and palladium have gotten so cheap they may just stop mining ’em. The GOLD PRICE rose $3.90 (0.35%) to $1,094.10 while silver gained 14.6 cents (1%) to $14.816. Yes, they have to better this, keep going, confirm. But today gold’s MACD turned up, along with Full stochastics, rate of change, and RSI. On much higher volume. It ALMOST broke out of that pennant upward. Next step is to breach resistance and 20 DMA at $1,105. Silver Bumped plumb up to the top of its range today with a $14.99 high, and closed over $14.75 resistance and its $14.78 20 DMA. Must break through $15.00, but that should come Monday or Tuesday. Buy gold on a 1 day close over $1,106, or silver on a close over $15. Y’all’ve been waitin’. Now do something. Do y’all reckon the vampire killer relishes pounding that wooden stake in the vampire’s heart? Now what makes me think of that when I go to discuss the US dollar index? Dollar index has been topped, blocked, and sealed. Back in June, y’all recall, it broke upside out of an even-sided triangle. That rise lasted until 98.31, when it hit the wall and slid down it. Wednesday it hit 98.33, but couldn’t close up there. Thursday it slipped down, then today again tried that top with a 98.43 intraday high. From there it lost 75 basis points to end the day at 97.62, down 0.24%. So the dollar index tried twice to penetrate 98.33, but failed both times. That shouts that the dollar is NOT going to continue its rise begun in July 2014, about the best news silver and gold could get. 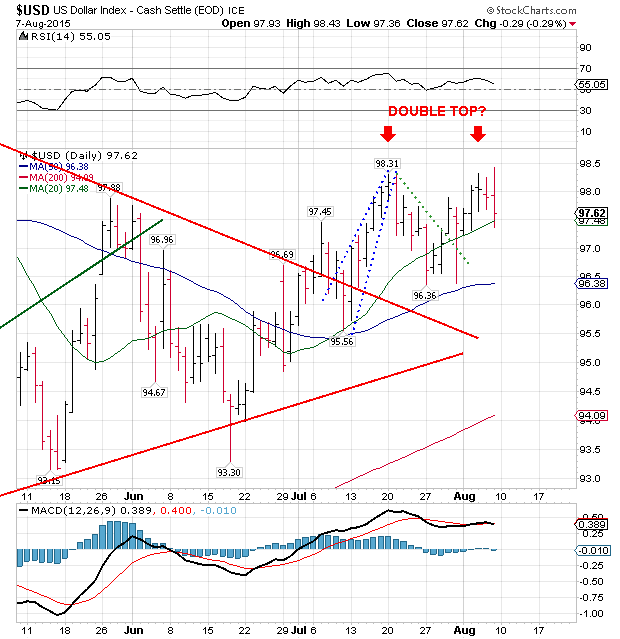 Scrofulous US dollar index chart is on the right. You’d think that the lying US jobs report which deftly fabricated better employment, which implies the Fed will raise interest rates next month, would send the dollar up, since interest rates are a prime driver of exchange rates. Most likely it was speculators “buying the rumor and selling the news.” By the way that lying jobs report was so good it said the US economy created 215,000 jobs — enough so that, according to the report, Bigfoot has found a new full time job AND a part time job and Santa Claus is hiring new elves. Euro and yen dithered and dodged around about like they have been doing. ‘T’aint so. Stocks are dropping because they are sick as a hound eating arsenicked meat ALREADY. They have been rolling over all year, and didn’t need no lying jobs report to push ’em over the cliff. Oh, and Mercy! They are a-fixin’ to drop harder and further than anybody in the media can imagine. Even a nat’ral born durn fool from Tennessee can see that, but not them Wall Street smarties. Dow lost 46.37 (0.27%) today to close at 17,373.38. What signifieth that number? It’s below 17,400, which had caught the Dow two previous times (17,465 and17,399). That close also pushes the Dow over the support line stretching back to March, and sets it up to break the year’s low at 17,038. Watch, just y’all watch. Chart on the right. S&P500 lost 5.99 (0.29%) to 2,077.57. Watch that 2,039 March low. S&P has formed a broadening top in a broadening top, and only by the skin of its teeth closed above its 200 DMA (2,073.24). Stocks have broken. High was back in May. 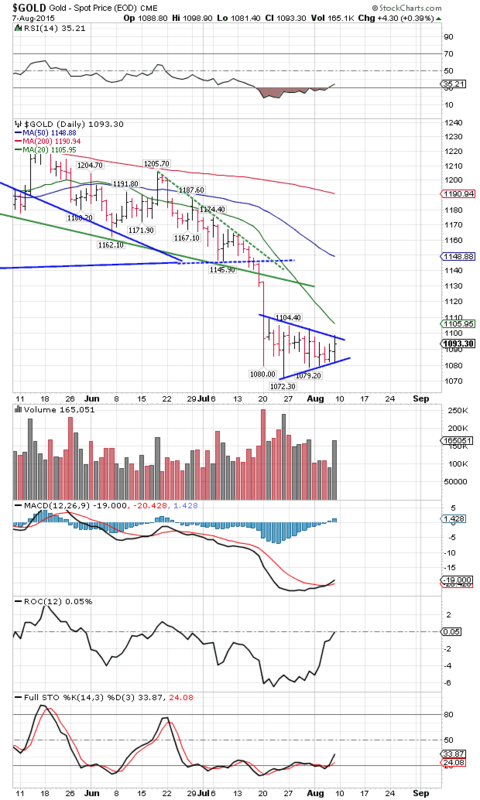 As I expected yesterday, the Dow in Gold and Dow in Silver both broke through their uptrend lines today, and cinched a fall through their 20 DMAs. 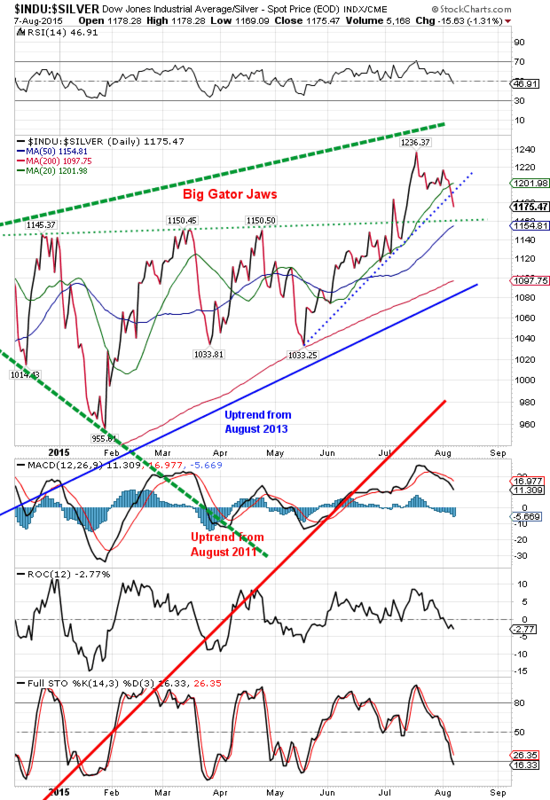 Dow in gold stopped a gnat’s eyelash from puncturing the top gator jaw and ended at 15.88 oz. 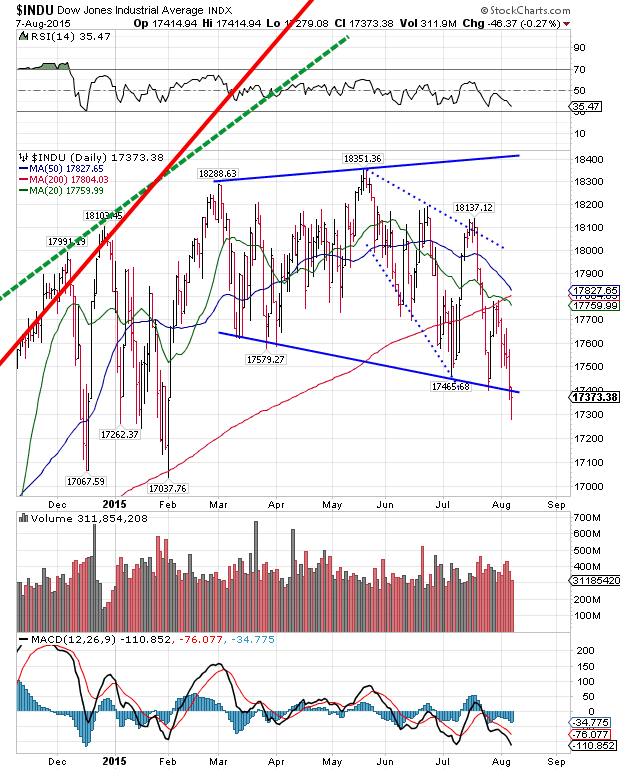 Today also confirms a down trend with a lower high and two lower lows. ‘Twas a down week. Indicators unanimously point down. Lo, the Dow in silver punched through that 20 DMA and uptrend line today like your finger punching through wet cardboard. Ended at 1,172.21 oz., down for the week.